I used to watch The Muppets on TV as a child, but haven’t seen any of their recent films. 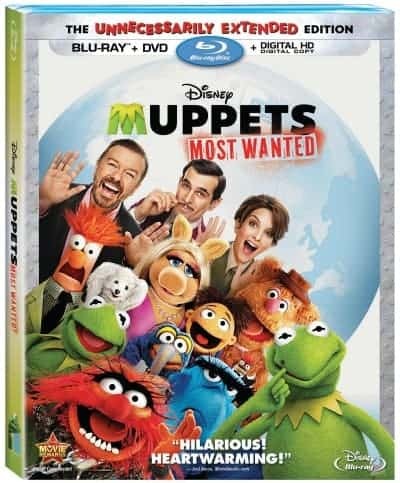 Muppets Most Wanted begins where the last Muppets movie left off. You could watch this as a standalone movie though because I hadn’t seen the other movie and was fine to follow along. Seeing the Muppets again brought back fond childhood memories of seeing my favourite characters again on the screen. Miss Piggy was always my favourite and she gets lots of screen time in Muppets Most Wanted. My favourite scene was watching Miss Piggy and Celine Dion’s duet! I didn’t realize Celine was in the film so it was a real treat to hear an original song from her and Miss Piggy. The Blu-ray + DVD copy has three versions of the film: Original Theatrical, Extended and Statler & Waldorf Cut. I only had time to watch the Original Theatrical version, but plan to watch the other two versions soon. My favourite human character was Tina Fey who played a Russian prison guard. She was so funny! I loved her song about the Gulag (Russian jail) with the inmates. Expect lots of songs, dance and laughs. I forgot just how funny the Muppets are! Both Bridget and I were laughing throughout the movie and tapping our feet to the music. It’s a great movie for the whole family to enjoy…moms and dads too! Check out Kermit’s personal message to me! I haven’t seen the Muppets in years…. Must see this one, it’s a bonus that Ricky Gervais is in this, he’s pretty awesome! My children used to love watching the Muppets, I wonder if my grandchildren will too. Missed this in the theaters, will watch the DVD! Would love to see this movie, it looks much better than the last movie!! I grew up with the Muppets and so did my girls. Nice to see the next generation is enjoying them just as much! How can anyone not love the muppets! We will have a movie night when it comes out.thank you for the review it sounds great! Muppets are classic! They make me laugh and my kiddo just adores their goofiness. This is such a fun family movie night pick. Definitely going to watch this. I still love the muppets! Somehow, we missed this in theatres. This would be perfect for our family movie night. I have to pick this up! I was wondering about this movie. I just may have to watch it with my kids now! I too watched the muppets as a child. This sounds like a great movie. Thanks for the review! 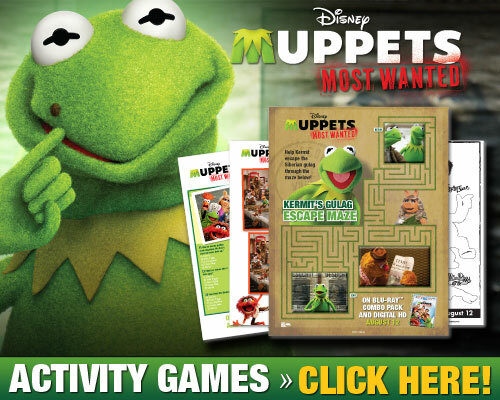 I grew up with the Muppets so I am definitely going to have to check this out. I am sure my niece would love it too! I always loved the two guys in the balcony that heckled everyone on stage. My kids loved the Muppets, now it’s the grandkids turn!